My family loves these personal sized meatloaves. 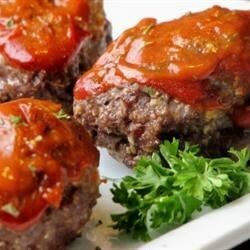 They are 245 calories each made with lean ground beef or 210 made with ground turkey. Dovetailing Tip: Pull out the Mini Meatloaves that you prepared for Meal 3 and bake. Easy peasy!